We’re making a noise about how we minimise noise! And shouting about how our customers can achieve the quietest sound outputs for their air blast coolers and adiabatic coolers. We help consultants adhere to the most stringent noise specifications for their projects – whether they’re responsible for a cooling installation in a data centre, or in a public building like a university, office or hospital. The reality for all these places is that ambient noise needs to be as free as possible from any background rumblings and murmurings. Patients and staff don’t want to hear annoying and deafening sounds coming from large coolers on the roof, or humming from the basement. 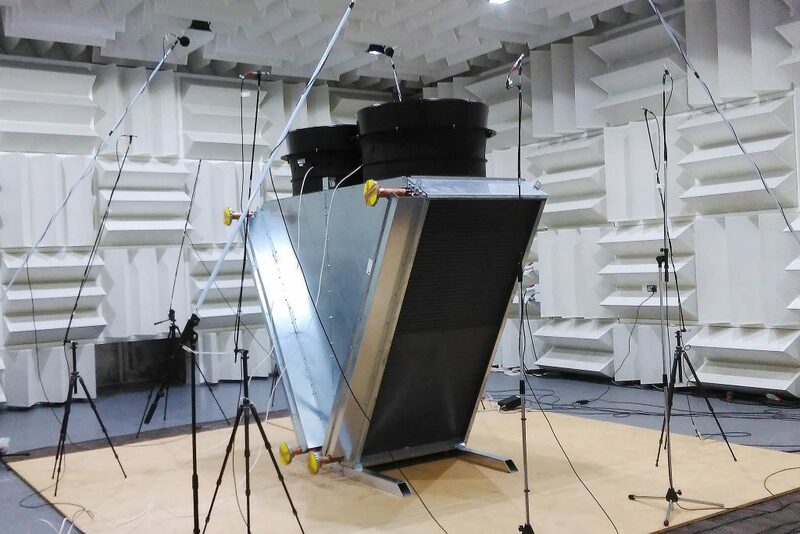 We make sure our equipment is tested to comply with the latest British standards, putting them through an independent – sound deadened – anechoic chamber testing regime. This “free field condition” logs any raw Lw sound power levels and allows us to give detailed 1/3 octave band data. This detailed level of information can then be used by professional acousticians to accurately predict on-site installed levels, factoring in everything from where it will sit in the building – such as being installed next to a wall, or surrounded by other machines – and how much noise will be reflected from this proximity. It’s a way to be very transparent with our clients, so they can build product noise data into their building plans, and ensure that any person, standing anywhere on their new site won’t experience noise emissions outside of specified parameters. We’ve been testing new fans just this last week at AVA Consulting, so whether it’s a 2 fan cooler, or a huge 26 fan machine you need – we can tell you exactly how loud it will be and how it can be accommodated in your building.